I have not tasted Mixed Pork Soup for a very long time. 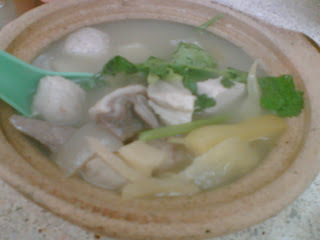 The other day, I discovered a stall which sells Mixed Pork Soup at Restaurant Lai Kong in Dataran Mentari, Sunway. Thus, manned by foreign workers, the soup and pork taste good. The pork intestine was cleaned properly. I hate it when some stall doesn't clean the intestine properly thus making the whole pot of soup stinky. At the same venue, there is another stall which sells Stew Duck Rice/Porridge. 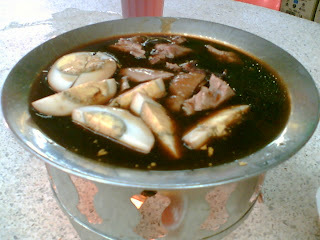 Aside from duck meat, they also have stewed egg, pork meat, taufu and pork internal organs. They will give you and plate and you just pick whatever you want. Then they will bring it to you table in this little pan with fire under it to keep it warm. Price depends on what you take.